I am not a fan of outsourcing the bulk of a brewery’s social media to an agency because it really steals from the authenticity that craft beer fans love about breweries. Posting yourself and/or creating a social media policy in-house and allowing an employee (or employees) to post is one of the best ways to reach your followers and increase engagement. So, with that said, this article is all about ideas to get you thinking about some new, or maybe not-so-new ways for your brewery to increase engagement and grow your brand on Instagram. Before we start there are a couple important things to note about Instagram’s algorithm which is heavily weighted towards time+interaction. So, the faster people respond to your posts by commenting and liking, the more likely your post is to be seen by others. This algorithm also plays into the “top posts” that reside under hashtags. Always keep this in mind: More engagement = More visibility on Instagram. @reply to your followers – Want to build fans that really, really, love your brewery? Don’t ignore the people who engage with your content. Be sure to answer questions and interact with your followers when they comment on your posts. The Instagram algorithm rewards brands with more visibility when they post engaging content regularly. So, not only with this give you big ups with your followers, it will also allow your posts the possibility of being seen more. Win-win! Seek to entertain and tell your brewery’s story through photos – Funny, interesting, and endearing posts will always get more engagement than promotional and self-serving posts. First, before you plan a post, think “would I find this interesting?”. That is a good litmus test. If it looks like an ad – it’s probably not going to get much engagement and should be posted sparingly. Get new followers by using hashtags – Hashtags are a great way the main way to introduce your brewery and beer to new people. If you get enough interaction on your post, your brewery’s photo could end up in the “top posts” for that hashtag. I recommend breweries use some slightly obscure hashtags that people might stumble upon down the road because the likelihood of your image ending up in the top posts and staying there long term is pretty good if you get enough likes. For example, if you have a tap room or brewpub, try hash-tagging city names around the location you are posting about. Also, try using a couple really popular hashtags with several less popular ones. The popular ones will get engagement quickly and can help boost the visibility of the post on other hashtags and in your follower’s stream. pro-tip: install the ritetag chrome extension to help you figure out what tags are worth using. Place a relevant link on your profile that leads back to your website – Add your brewery’s homepage URL to your profile, or you can point that link to a new beer release, menu item, etc. and change it regularly. When you post, tell people to check the link in your profile for details (because you can’t place URL in your post). Get super-nerdy and track the traffic you get from Instagram (and any other campaigns) in Google Analytics using this nifty tool. Use apps to make photos more interesting – Apps like Prisma that have added filters and the Boomerang addon can put motion to short clips. Video – Currently video is getting preference in Instagram’s feed, so post short videos in your brewery, at beer fests, etc. If in the tasting room, try and get video when the room looks full. People gravitate to popular places. If shooting in motion, check out Instagram’s Hyperlapse feature (how it works). Tag someone who ___________ – Fill in the blank with all sorts of fun stuff like “needs a beer, likes hoppy beer, can’t hang, etc.” You get the picture. Double tap if you ____________ – Same as above. “need a beer, can’t wait to get off work, are happy it’s Friday, etc.” Of course, always use images that in some way tie your brewery to the post subject. Both of these types of posts allow for easy engagement and generally get more likes because you are asking followers to take an action (which is good to keep your engagement up and keep the Instagram algorithm happy). Behind the scenes – People love to see beer being made. They like learning about the ingredients and the people who bring it all together. Be sure to include photos of the brewing process, ingredients, heck, even cleaning out the mash tun is interesting and helps further the crafted aspect of your brewery’s story. Share your follower’s posts – People like to have their ego stroked and like to feel validated (admit it, you do). So, make your followers some of your biggest fans and brand advocates by sharing their posts with your followers. Create a hashtag that you can easily follow or just review those that used your @ handle and share the ones that you think would resonate with followers. Make sure to thank and tag them in your comment and they will likely be very appreciative. Since Instagram doesn’t have a native ability to re-post on its own, search for an “Instagram Repost” App that suits your liking in The App store or Google Play to make this easier if you aren’t on a desktop computer – otherwise just copy and paste the photo to a new post. Ride the popularity of trending topics to grow exposure and get new followers – Holidays, local events, and other topics that are on your follower’s radar are great themes to build content around. Hold sharing contests – Ask followers to share and mention your brewery in a photo of them interacting with your brand. As a reward, offer to share your favorites with your brewery’s followers. Be sure to give a date or time to “enter” by and when you do share your favorites and give credit by using the photographer’s @name in each post you share. This is a great way to raise awareness of anything new that might be happening, as you can theme your “contest” around new releases, events, etc. Throw Back Thursday #TBT – Tap room makeover? Label change? Head brewer without a beard? Post pictures of how far you’ve come or other fun photos from back in the day. Introduce your staff and new hires – People like to connect to other people. So, share your new hire’s story and their love for craft beer. Highlight quirky things about them and give your followers another reason to remember and connect with your brand. Meet Amanda – Taproom Bartender Favorite El Segundo Beer: Two Five Left Double IPA Favorite styles to drink: Every style, it changes from mood to mood, season to season but currently I can’t turn down a robust porter or an Imperial Stout, even though it’s a 100 degrees out. Favorite hop: Mosaic Favorite non beer alcoholic beverage: Boulevardier (rye whiskey, Campari and sweet vermouth) Favorite quotes: “Ah beer, the cause of and solution to all of life’s problems. -Homer Simpson What was your first craft beer experience? I was 20 years old and playing darts at a very well known craft beer bar in Orlando (that I would later become a bartender at) and someone passed me a liter of Rogue Dead Guy. My life was changed forever. Favorite part about working in beer: The people. Working beside people who truly love what they do and then turning someone who has never known a good craft pint into a beer lover themselves. That’s just a recipe for happiness right there. 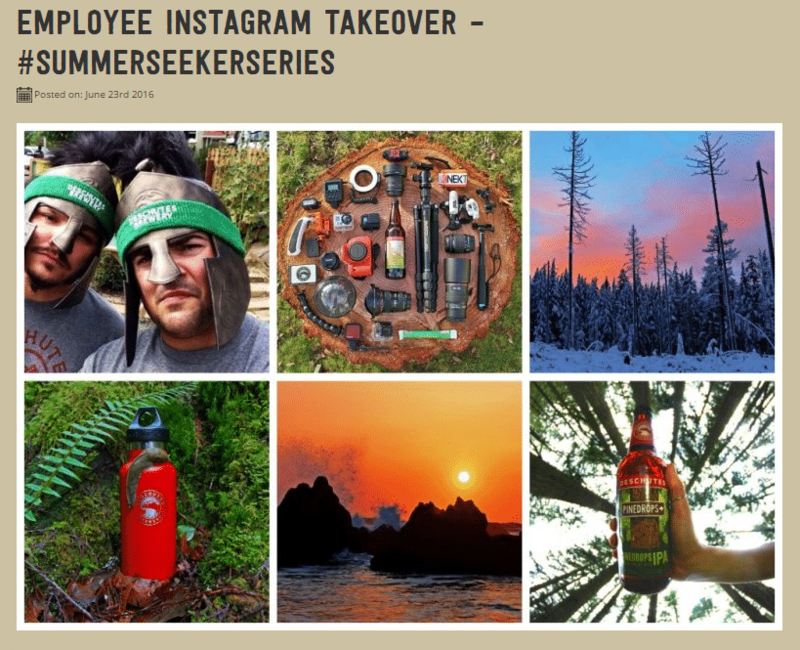 Brewery employee Instagram takeover – Here is a fun idea from the folks at Deschutes who are reinforcing their message that they are employee owned and operated by allowing a few employees, who happen to take great photos, to “take-over” their Instagram feed for a week. They incentivised the initiative for employees by offering up some cool freebies for those posts that got the most engagement- in turn, employees gave a fresh perspective to their feed and followers reacted positively. Cross promote – For example, you can share your appreciation for restaurants and bars that have your beer on tap by keeping their posts on your radar to reshare when relevant. If they post a new tap list or have a photo of their tap handles, with yours included – share it! Same goes for events your brewery is involved in and going’s on in your community. If it’s seen as good will it will generate goodwill with your followers. Promote beer holidays – Yeah, there is literally a holiday for everything if you look hard enough. This is a fun opportunity to share your beer centered around a theme that people will be more likely to engage with. Don’t forget to use the appropriate hashtag! pro-tip: import this calendar into your Google calendar to stay in the “beer holiday” loop.